When you go camping, you don't carry all your supplies by hand. You throw your gear in a backpack to make your hikes easier. So why do people still use handheld leaf blowers? 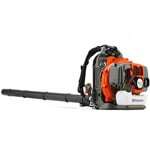 You'll be amazed how much easier big leaf blowing jobs can be with a backpack blower. Ergonomic products are designed to fit the human body and its movements to avoid repetitive stress injuries. The full tension support system that keeps the blower on your back distributes the weight evenly across your back and shoulders preventing fatigued from extended use. The throttle controls on backpack blowers are also ergonomically designed to keep your hand and wrist in their natural positions. This will greatly reduce fatigue as you move piles of leaves all day. Two-cycle engines require a mixture of gas and oil in the fuel tank. Also known as 2-stroke engines, this type of engine is lighter and simpler to maintain than a 4-cycle engine. Two-cycle engines also have the potential to pack about twice the power into the same space as a 4-cycle engine. This combination of light weight and twice the power gives 2-cycle engines a great power-to-weight ratio compared to many 4-cycle engine designs. Models with 4-cycle engines are very similar to the car you drive – gas goes in the fuel tank and oil goes into the crankcase. They work in the same manner as a car engine as well. They are more fuel efficient than a 2-cycle engine, so you get more “mileage” out of every tank of gas when using your 4-cycle leaf blower. A 4-cycle engine also has the capability to produce more overall power than a 2-cycle engine. However, this will result in a larger engine in terms of size and weight. Due to pollution issues in its state, the California Air Resource Board has enacted legislation which requires small engines meet emissions standards. Lawn tools such as leaf blowers fall under this regulation. If you live in California, make sure you choose a CARB-compliant leaf blower. While older blowers had developed a bad reputation for their emissions, CARB-compliant models are more efficient and run cleaner. They will, however, still emit some pollutants. Backpack Leaf Blower Buying Guide.. Our Power Equipment Direct how-to library can help you learn about Shindaiwa Leaf Blowers, Proposition 65 Product Labeling and Sales Tax Information.